Clarkston Hines had huge numbers playing for small fish Duke with quarterback Anthony Dilweg, becoming only the second player in NCAA history at the time to post 3 1,000 yard seasons. In fact, he demolished the school’s record book and finished 6th All-time with 3,138 yards and 38 touchdowns over his career. At 5-11, 163 though he was considered undersized but the Bills took him in the 9th round of the 1990 draft. Stacked at receiver though with Andre Reed and James Lofton firmly entrenched as starters, Hines would not make the roster. Drafted by the Raleigh-Durham Skyhawks in the WLAF with a supplemental choice of the 1991 draft, the team was a patchwork monstrosity at quarterback once the season began, but their receivers fared quite well. Clarkston was the big play threat. He’d finish 9th in the league with 31 receptions for 614 yards and a titanic 19.8 YPC. He had his best day against Orlando posting 6 receptions for 117 yards and 2 touchdowns, including a 55 yarder. 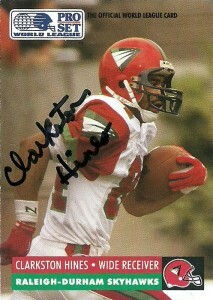 After the season, Hines elected not to return to the WLAF. He currently is Vice President of DaVita Inc and resides in North Carolina. The under the radar athlete also has received numerous awards since retirement including being inducted into the Duke Sports Hall of Fame (1999), The ACC 50th All Time Team (2002) and the College Football Hall of Fame (2010). I’ve had a difficult time getting Clarkston, failing both at home and work over the last 2 years, but luckily another member of SportsCollectors.net was willing to float the address to me and the 3rd time is a charm. He also sent me a testament letter about Christ as well.